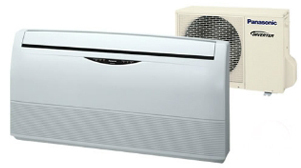 Get the best of both worlds when you install this range of floor- or ceiling-mounted single split Inverter heat pumps: powerful heating and cooling capability, with Inverter efficiency. Elegant, simple, highly efficient range of single-split Inverter heat pumps, with floor- and ceiling-mount capability and up to 6.10kW output (CS-E18DTEW model). Slim in appearance and flexible in installation options, the Floor or Ceiling range of single-split Inverter heat pumps delivers the best of both worlds – in so many ways. Whether you choose to install the slim indoor unit upright at floor level or flush against the ceiling, Panasonic Inverter technology delivers all the benefits of an Inverter system – including quick comfort thanks to powerful output right from the start; and quiet, efficient, energy-saving operation thanks to flexible power control. And despite its impressive output, Panasonic Inverter technology makes the Floor or Ceiling range efficient enough to earn up to 4 Stars on the Energy Efficiency rating scale. While each of our Floor or Ceiling models provides plenty of heating and cooling power, they also feature industry-leading quiet operation for greater comfort, moving air without making much of a fuss. And should you include the optional anti-allergen, anti-virus and anti-bacterial SUPER alleru-buster filter technology, that air can be cleaner and more healthful. Plus, the built-in Anti-Mould, One-Touch Air Filter and Odour Removing Function work to keep the unit clean even when it’s installed in harder-to-reach places, like up against the ceiling.